A gaggle of young adults dressed to the nines on a street corner in Silver Lake, CA, is not an uncommon occurrence. It probably happens every day for some reason or another. It’s not so common, however, when the entire street corner itself is also dressed up. 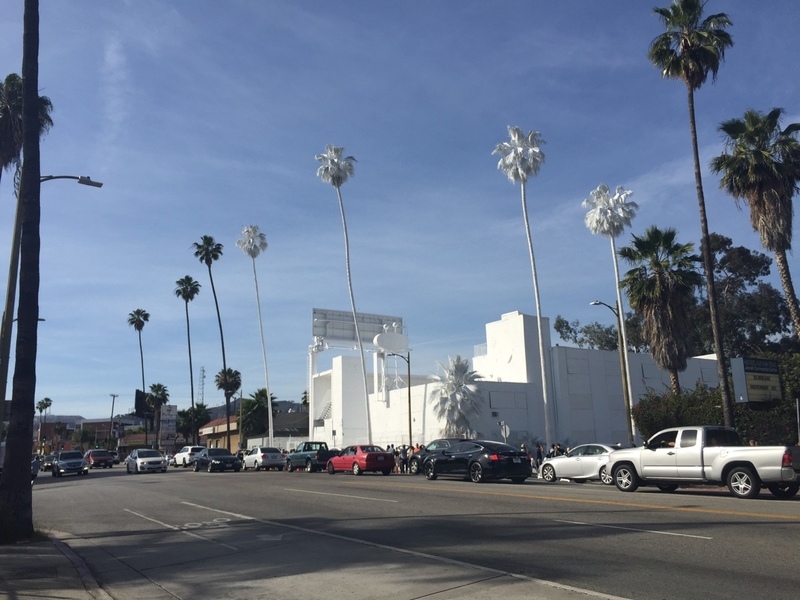 At the intersection of Bates and Sunset, you can see an entire block coated in white wash. The former Bates Motel and its surroundings, including fences, barbed wire, palm trees, and shrubbery, are all covered in an organic, lime-based white wash to create a sort of living black-and-white photograph. This is Projection, by Vincent Lamouroux and produced by Please Do Not Enter, a “one-of-a-kind” curated store in Downtown Los Angeles. The opening, held on April 26th, was anti-climactic for those in the area who had driven by the piece in the few days prior. One Los Feliz native, KD Stapleton, described it as "underwhelming." It’s a public art piece, so you can’t really avoid seeing it. This might be my favorite part of it, but there was still a slight air of “is this it?” at the opening. Until, of course, it got crashed. “Crashed” is not the perfect word, but it’s really the only way to describe the activities of Julia McAlee and Clint Hanaway. Donned in all white with skin painted to match, McAlee arrived at the opening of Projection and traipsed about while Hanaway filmed and bystanders took pictures. Everyone, including myself, was unsure weather or not this was a part of the piece, so I talked to the culprits themselves. Sarah Doyel Davis: What made you decide to do it? Julia McAlee: We live right down the street from the installation, and when it appeared on Sunset a few days before the opening, it really struck me. You're driving and driving and seeing the normal landscape of LA, and then this little section is ghost-white. It looked so odd and beautiful. I briefly performed in Santa Monica on the promenade as an all-white musical human statue a couple years ago, so my first thought was - I should dress up in my old get-up and come hang out. But then as Clint and I talked about it and conceived exactly what we were going to do, our idea expanded beyond just the aesthetic similarity of a painted white person interacting with a painted white landscape. I started thinking about the painted lady as a character; she's lonely and doesn't feel like she fits in anywhere, except for this one place that's exactly where she wants to be, but the gate is locked. Clint Hanaway: We wanted to create a performance art piece that was actively interacting with an already established installation art piece. Art crashing art. We titled our piece "Dwelling," because that word has several shades of meaning that capture our concept. Dwelling can mean “lingering,” or a place where a person lives, but the word has this implicit impermanence because “to dwell" somewhere carries the idea that you will eventually leave. I intended the video as a loop, art that could come and go. I think that ties in with the fact that the building used to be a hotel where lots of people would stay for a time then leave, but also with people’s emotional connection to places they’ve been. SDD: What was the artist's response? CH: I don't actually know. We met some other people that were involved in the project before the opening, and they were talking about how all these people were doing interesting things with the piece already, photo shoots and some fashion shoots. They seemed very enthusiastic and excited about that. I think a French artist would appreciate mime-artistry captured in a Cinéma vérité style. JM: It's a public art piece, so how people interact with it is huge. So I'm guessing he'd be into it. I wasn't speaking to anyone when I was painted though, so I didn't get to speak with him about it. SDD: How did the crowd at the opening react? CH: It was an interesting spectacle because the crowd didn’t know weather or not Julia was an official part of the event. Some people immediately accepted it as part of the experience, while others chatted about weather or not they thought she was officially involved. But either way, everyone wanted a picture. JM: Mostly people wanted to take photos of me or with me. Sometimes I interacted with people but sometimes I chose to ignore them. SDD: Were there any memorable interactions? JM: The most memorable interaction was actually after we drove home. This middle-aged woman was staring at me, shaking her head and making noises, so I waved and smiled trying to be friendly, and then she hissed at me and turned her back on me. CH: At one point in my film you can see a man ask her if she’s the artist, that really struck me. SDD: You seemed to become a part of the art via osmosis, have you done anything like this in the past? CH: I do a lot of documentary-style, behind the scenes videos for commercials and music videos, and often my pieces end up being released as part of the primary project. I think art is about human interaction. I’m a human, so I can only interact with art from the perspective of a human, but if I can convey my personal reaction with an art piece through my own medium then it’s supplementary to the art. It becomes part of the experience of the original. Often my medium is film, but other times I build custom motorcycles. Creating a machine as art is a fairly intimate process. You have to connect to your experience of an object, personify it, and try to understand what it would want to become. Then you create, you help things become what they dream of. JM: The musical human statue [in Santa Monica] is the most similar, and I've also played music on the street while traveling in Europe and Australia. I think all street performing is kind of similar to this performance piece because when you're on the street you become part of the landscape, you're not separated from your audience like a performer usually is when they're on a stage, or even further removed via the filming process. When you're right down in the middle of the audience, standing next to them, breathing on them - it can get scary, it can get weird. It can get ugly and real sometimes in a way that just doesn't happen otherwise. But I also think that when art in any medium is really affective and affecting, there's a kind of merging between the audience and the art piece. Clint and I both work in a variety of mediums, so I suppose that sort of merging is always the highest goal. I'm a singer-songwriter, and a lot of my songs also explore themes of belonging, home, and death. Watch “Dwelling” here. Projection will run through May 10th.